Not too long ago, I discovered a new appreciation for radishes after roasting them, thanks to a recipe in Fresh Every day by Sara Foster. Although I used them in a salad from another cookbook, I was intrigued by a note under the radish recipe: "Reinvention: At the Market, we toss roasted radishes into a salad with arugula and Spicy Pecans (recipe also in the book). If you want to do the same, roast the radishes in olive oil and vinegar instead of butter and use the pan drippings to dress the salad." I decided to make the Spiced Pecans, roast some more radishes and make the salad, adding some crumbled goat cheese and some sweet little tomatoes with a simple vinaigrette. A perfect light and healthy salad for lunch or dinner. You can follow the above link to find the directions for roasting radishes. About the pecans, Foster notes: "I know from experience that you will eat a handful of these pecans before they even see the salad so I made this recipe for twice what the recipe calls for. You might want to double it again, since they are good thrown into just about any salad and also make a delicious cocktail snack." Combine the pecans, vanilla, and olive oil in a medium bowl and toss to mix. Stir the rosemary, cinnamon, salt, pepper, and cayenne together in a separate, small bowl. Sprinkle the spices evenly over the pecans and toss again. Spread the pecans in one layer on a baking sheet with sides and roast, stirring several times during the cooking process, until the nuts are crispy and brown, about 15 minutes. Let the pecans cool to room temperature on the baking sheet, stirring several times while they're cooling to prevent them from sticking together and to the pan. These will last for at least a week in a sealable bag. If you are storing them, make sure they completely cool before placing them in the bag; otherwise, they'll soften in the bag. Notes/Results: A wonderful salad with lots of flavors and textures. There were no details on the salad Foster's Market serves, other than the arugula, radishes and pecans but adding the goat cheese gave it a nice creaminess and the tomatoes added a little sweetness. Sara Foster is right about the pecans, I snacked on them while they were cooling, while making the salad and for the next couple of days. The combination of flavors and spices on the pecans is great, they have just a small kick from the cayenne and black pepper but you could easily up the amount of chili to make them more spicy. The spiced pecans would make a great hostess or holiday gift. A keeper recipe for sure. As I mentioned in yesterday's post, I am celebrating my recent one-year "blogoversary" and my 300th post by giving away a different foodie prize for the next three Saturdays. 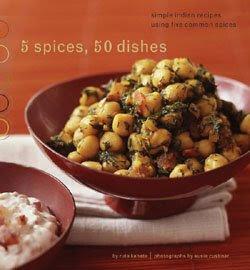 To kick it off, the first giveaway prize is one of my favorite cookbooks; 5 Spices, 50 Ingredients: Simple Indian Recipes Using Five Common Spices by Ruta Kahate. Whether you have a lot of experience cooking Indian food and want some great tasting recipes or you have always wanted to try cooking Indian but have been intimidated by long lists of hard to find ingredients, this book is for you. Kahate's recipes use different combinations of 5 easy to find spices; coriander, cumin, mustard, cayenne pepper and turmeric, to create simple but delicious Indian dishes. I have posted a couple of the recipes from this book; Lamb Chops with a Spicy Rub and Baked Fish in a Spiced Broth, and have made many of the other recipes. There are some great vegetable recipes in this book too, so there is a little something for everyone. How can you enter to win this fun cookbook and add it to your collection? It's simple. Just leave a comment on this post before noon (that is noon Hawaii standard time or 3:00 PM PST and 6:00 PM EST) on Wednesday, May 6th. Since this book is all about the spices, in your comment tell us what your essential 5 spices are. The 5 dried spices you absolutely must have and would keep if you had to give all other spices away. (For example, mine are fresh ground black pepper, cumin, turmeric, cinnamon and red chili pepper flakes). The winner will be randomly drawn from the comments and announced on Thursday, May 7th. The prize will be sent out once I have the winner's mailing address. You can enter to win regardless of where in the world you live (as long as you can get mail!) and you can enter even if you don't have a blog. Pretty easy! You can tell your friends and family about the giveaway so they can enter, or maybe you will want to keep it "secret" to keep the numbers down and improve your odds! ;-) Either way, I hope you enter and look forward to giving out some fun prizes over the next three weeks. What a great looking salad, so colourful. I am going to have to give roasting radishes a try. My top 5 spices - freshly ground black pepper, cumin, coriander, caraway and hot pepper flakes. Woohoo! Chili powder, cinnamon, cumin, nutmeg & basil. your salad looks delicious.. and thank you for the chance.. fingers crossed. Oh my gosh, these pecans sounds amazing..the salad looks so great with all the flavors and textures and colors! Note to self: I really need to get around to roasting some radishes. The pecans sound amazing! A great sweet/savory combo. I would have to hide them from myself. As for top spices...that's a tough one. I would have to say cumin, cinnamon, basil, cilantro, and red pepper flakes. I'm going to have to try roasting radishes! My favorite spices are black pepper, pimenton(sweet smoked Spanish paprika), caraway seed, fennel seed and mustard seed. The salad looks great. I cannot wait to try roasting radishes. I'm still amazed by your 300 posts! What a fun giveaway series. black pepper, hot pepper flakes, chili powder, cumin, nutmeg. btw, last night I did the drawing for my 200th post giveaway and you won! I'll get in touch with you with the details. My husband loves radishes, so I'll have to give this a try! My five spices? Vanilla, cinnamon, nutmeg, cloves, ginger. The salad sounds great, especially with those pecans!! My top 5 Basil, thyme, sage, cinnamon, and red pepper. I just found your blog via girlichef and I'm glad I did - what wonderful recipes you have on here! my 5 are fresh ground pepper, fresh ground cinnamon, ground cumin, dried oregano, fresh basil. I love spices, here are my favorites: cinnamon, black pepper, nutmeg, fennel seed, basil. that salad looks so delish! i've already starred the post in my google reader. as for my top 5 spices, they have got to be cinnamon, nutmeg, clove, paprika, and freshly ground black pepper. both today's and yesterday's posts looked delicious! I just planted some arrugla, so I'll be looking for something to do with it in a couple months. My fav 5- chili powder, garlic, basil, cinnamon- that was hard! oooh touch... I have a ridiculous number of spiced!